Stay Safe in the Sun- FREE Skin Screenings! We are all excited to finally begin enjoying the summer activities on these sunshine days, but are you prepared to protect your skin too? Extra time enjoying the outdoors at the pool, parks, camping, or working in your yard or on the farm can also increase the risk and exposure to developing skin cancer. Plus a sunburn can really ruin a day of fun! We hope everyone will remember to be conscientious this summer to the growing rate of skin cancer in Idaho and across the U.S. to be more vigilant with following daily precautions. Avoid the Sun during Peak Hours! Seek shade particularly between 10am and 4pm. It is also recommended to check the daily UV index available on the daily news. Put on Sunscreen- Often! Use a daily broad spectrum sunblock with an SPF of 30+, even on cloudy days. Apply a lot and rub it in well at least 30 minutes before you go into the sun. Spray sunscreens must also be applied liberally- a quick spray over your shoulders will not do the job! Sunscreen should also be reapplied every two hours, especially if in the water, and remember to get sensitive areas, such as the face, ears, bald areas, and lips. Wear Protective Clothing. Accessories such as a wide-brimmed hat, sunglasses, and dark long-sleeve shirts or pants are all recommended for better protection. Special sun-protective clothing and swimsuits are also now available and great for kids. Don’t Try to Tan. Avoid lathering-up with oils in the sun and don’t use tanning booths they damage your skin, just like real sunlight. Get an Annual Skin Screening. Depending upon your job or other risk factors, you may need to do monthly or annual skin checks. Talk to your doctor about how often you should check your skin and at the very least have it checked annually or during your annual physical. 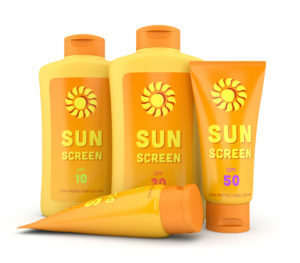 We hope everyone enjoys a fun and burn-free summer this year and don’t forget the sunscreen!